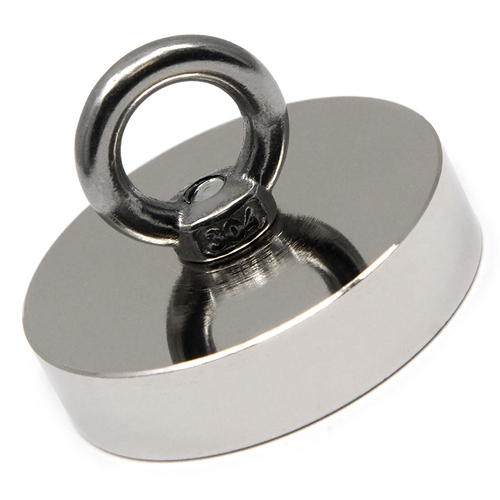 Cup & Channel Magnets, are also called round base magnets or cup magnets & even Pot magnets. Channel & Cup Magnets are made with permanent magnets assembled inside steel cups or channels. 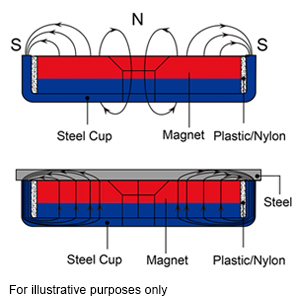 Most of the cup or channel magnets use either neodymium rare earth magnets or ceramic magnets. AlNiCo pot magnets can be found but Samarium Cobalt (SmCo) magnet is rarely used. The benefits of the outside covering of steel covering these magnets are strength and durability of the magnet. The holding strength of these cup or channel base magnet is much more powerful because the steel covering focuses the combined strength of of all sides of the magnet into the one non covered side. The steel coverings also protect the magnets from breaking, cracking & chipping for a much longer service life. CMS Magnetics & Magnets For Sale carry a very wide selection of cup & Channel Magnets for your next project. Neodymium round base magnets provide much stronger holding power than the magnets which are used in the same round base magnets since the magnetic field concentrate at the magnetic gap between the magnet and the cup edge. Since the magnet is enclosed in the cup, the magnetic field leak is also minimized. This also contributes to the great increase of the holding power for the round base magnets. On the other hand, the steel cup provides protection on the magnets from breaking or chipping so to increases the lifetime and applications of round based magnets greatly. 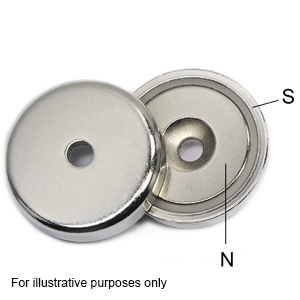 Neodymium round base magnets are used in furniture, signage, electrical wiring and car signs etc. 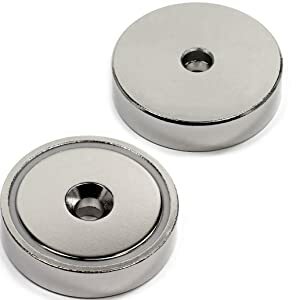 This high strength cup magnet or Channel magnets are neodymium or ceramic magnets encased inside a chrome plated steel cup or rail dependant on the style. This design greatly increases the holding power of the magnet, as well as protects the magnet from shattering or damage from everyday use, allowing it to last much longer than a plain magnet. 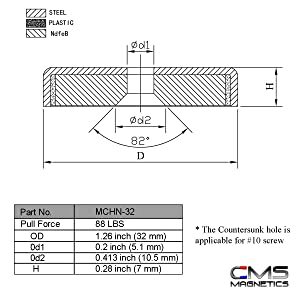 CMS Magnetics rare earth magnets are made of high quality neodymium magnetic material, which makes them up to 12 times stronger than ceramic magnets of the same size. This magnet can hold up to 88 lbs under ideal conditions, and is a neodymium magnet which due to its large size is extremely strong. They are magnetized through the 1/2" thickness so the north and south poles are on the flat surfaces, and the red line on one side of the magnet denotes which side the north pole is on. Sometimes ceramic magnets are enough with the focusing capacity of these enclosures even with the ceramic magnetic material these channel or cup magnets are super strong. These rare earth neodymium or ceramic Cup or channel magnets are made for holding stuff & that is what They do they do best. 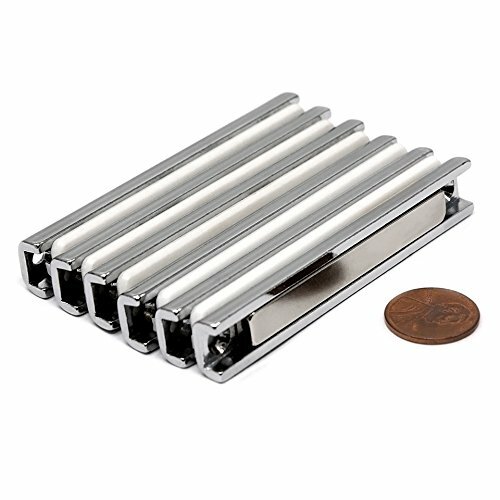 Neodymium magnets are unique because of their extreme resistance to demagnetization and will only lose their magnetism if they're heated above 176 degrees fahrenheit. These are not the magnets you played with as children 10-20 times the force of those old time magnets. Never experienced powerful neodymium magnets? Now is the time! Our rare earth magnets have a high saturation magnetization & tetragonal crystalline structure ensuring top physical pulling force & maximum energy product. 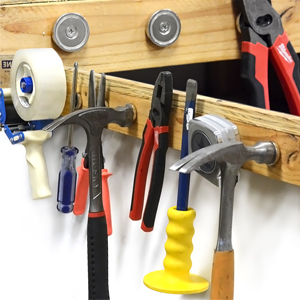 These magnets hold very well against steel surfaces with direct touch and direct pull. The magnetic strength will last forever under normal use. CMS Magnetics is an established supplier of premium quality magnets that are used in some of the most demanding and critical applications such as aviation, automation, and manufacturing systems that help shape the world around you. Because we strive to only supply the highest quality magnets, our magnets are all produced in state of the art facilities that ensure a high standard of both quality and performance are met. Besides neodymium magnets which are renowned for their strength and versatility, we also carry many different kinds of magnets that are all suited for different needs. From ultra high temperature resistant Samarium-Cobalt magnets to cost-effective and ubiquitous ceramic magnets, CMS Magnetics is a trusted and reliable supplier of ultra high performance magnets in an assortment of all shapes and sizes. Cup magnets have a shiny strong triple layer coating that consists of a base layer of nickel, a middle layer of copper, and an exterior layer of nickel for physical strength & corrosion protection. Cup Magnets are shipped with plastic spacers between them to make them easier to handle. If a magnet attaches to another magnet they can be very difficult to separate. See above or YouTube CMS.